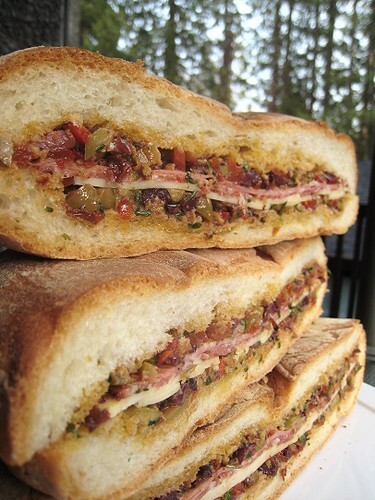 That towering muffuletta sandwich has salami, mortadella, Provolone cheese, and most importantly, an "olive salad". The mere thought of that olive salad is enough to make my mouth water. I mean, just look at that! 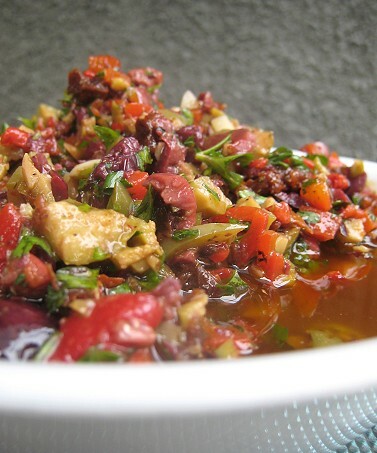 The olive salad is a mixture of green olives, black olives, roasted bell peppers, sun-dried tomatoes, some garlic, some dried oregano, lemon juice and olive oil. Oh, and some parsley too. 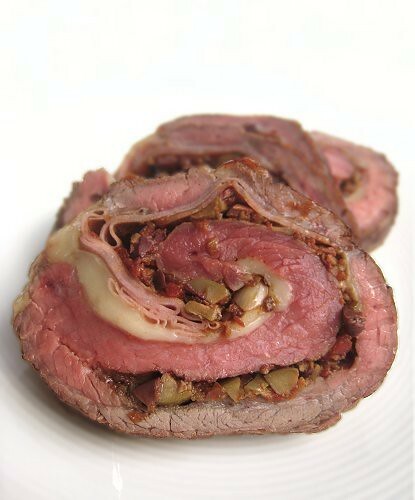 So, when we had some flank steak sitting in the fridge, we thought, "Why not stuff it with the muffuletta flavors that we love?" And so we did. I semi-butterflied the flank to even out the thickness, then layered a few pieces of salami, mortadella and Provolone cheese near one end. 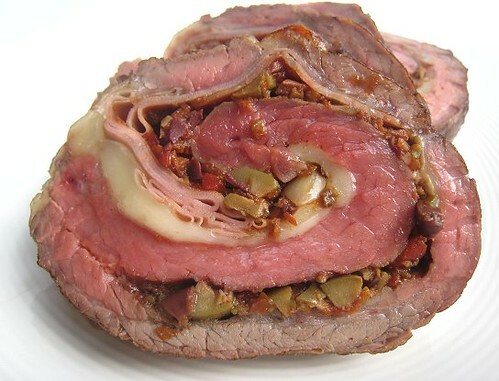 A generous amount of olive salad went on top of those ingredients, then I rolled the beef and tied it up. 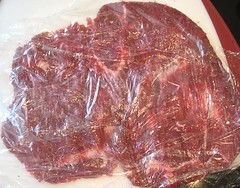 My first attempt at butterflying flank steak resulted in some tears and such. Oops. 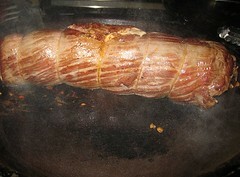 I seared the outside of the rolled flank, then finished it in the oven. 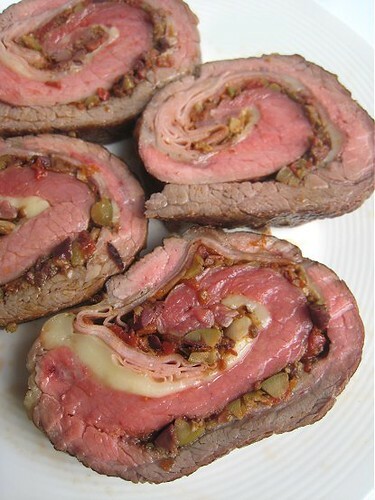 As you can see, the Provolone oozed out a bit from the tears in the meat. But, no biggie. We already know we love these muffuletta flavors, so it was no surprise that this dish was a success! Really, that olive salad is killer. One little flank like that did not actually last until dinnertime; we treated it as an afternoon snack. 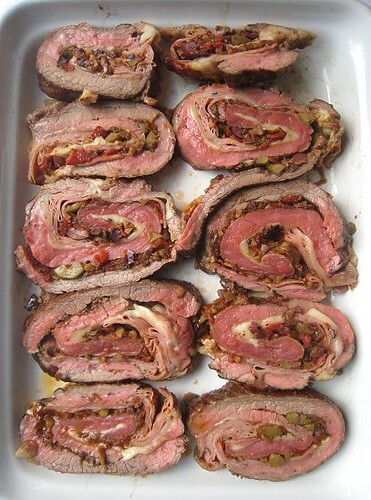 Butterfly and/or pound the flank steak until even in width. 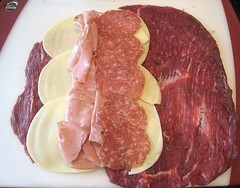 Place slices of Provolone cheese, salami and mortadella near one end of the steak. 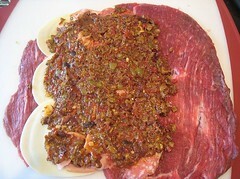 Spread the olive salad (use as much or as little as you wish) on top of the other stuffing ingredients. 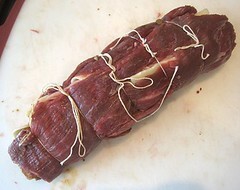 Roll flank steak and tie with butcher's twine to make a roast. 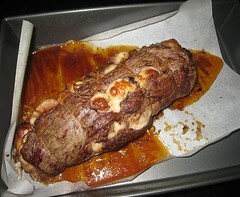 Heat a pan over high heat, add a little bit of oil and sear the flank roast on all sides until brown. 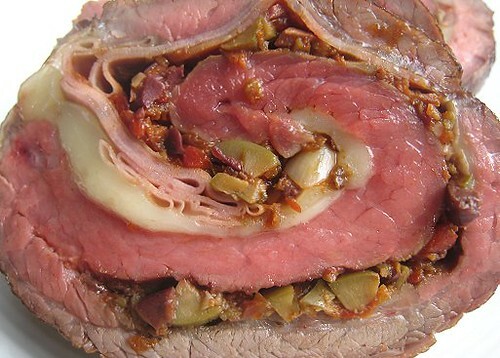 Place browned roast in the preheated oven for 20 to 30 minutes, or until desired doneness. Let sit for a few minutes, slice, and serve.